Avatrade – “Trade with Confidence” Here at Avatrade.com, this is their motto. But what gives their customers that confidence? That is why we’re here! 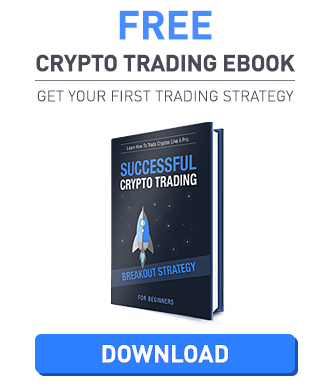 We will be looking into their website, how to create an account with them and try out their Free Demo, know how to trade, and know what their Margin and Leverages are. Avatrade.com was established way back in 2006 (more than a decade) and is located in Dublin, Ireland. They now offer their trading services to over 150 countries with offices located worldwide. They have full regulated and licensed operations in EU, BVI, Australia, South Africa, and Japan. Though they do not accept customers from the United States, they still offer a really good broker platform for the rest of the world. 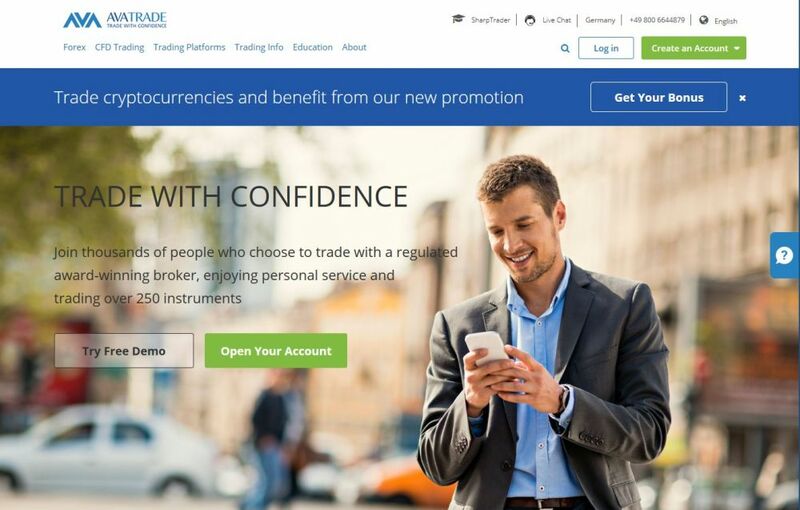 In addition, Avatrade.com is a broker that is registered in Ireland. Yes, not some shady offshore company that is registered in the Bahamas. As mentioned above, the website is regulated by the Central Bank of Ireland with the reference number C53877, they are also regulated by the Australian Securities & Investments Commission or ASIC and the Financial Services Commission of the British Virgin Islands. This website (broker) is also very well-connected on the far side of the world. Agencies such as the Financial Services Agency, the Financial Futures Association of Japan, and the Commodities Futures Association of Japan, are the bodies that help regulate their transactions. With this being said, new comers and old players are properly regulated no matter what level of trading they would be doing. With more than a decade of experience in the industry, with numerous awards, it is not strange to see people flocking to their website to trade. Now we know about the company’s background, it is time to move forward and create an account with them. 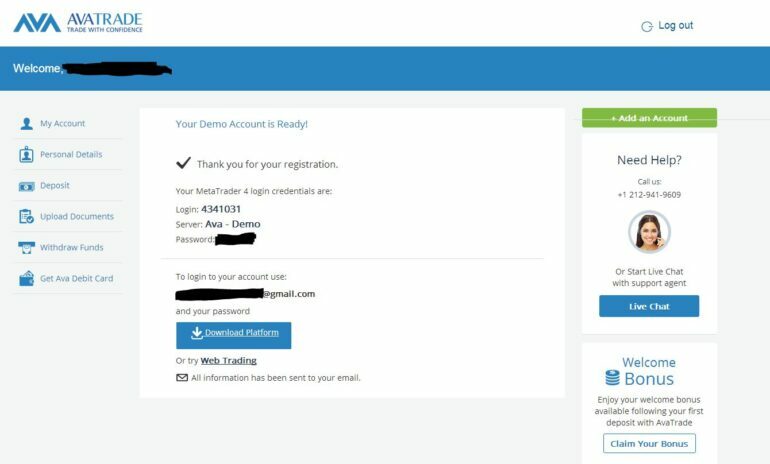 Not only will we be creating an account, we will also try and trade using the Demo Account they are offering and know how to take advantage of the Leverage and Margins they have for us. Are you ready? To create an account with Avatrade.com, we first need to head over to their website and click on the green tab saying “Create an account”, this will then give you two options to choose from. The first option would be to create a real account, with, of course, real money needed to be deposited. The second one is an option for us to create a Demo Account. Why a demo account you ask? Well, of course, if you have an option to choose and try a demo account, do that! Why? As a broker, you need your clients to feel at home and try out what your website has to offer before you expect them to trust and trade with you. This is not only a scheme to attract more clients to their website, but they also use it as a tool to compete with other websites that do not offer this feature. So if a website is offering a free demo account? Use that feature to your advantage! In creating an account, they would ask for your First Name, Last Name, and Email information, as well as your local mobile phone number. Once everything is filled up, just click create account which is found in the lower part of the screen. Once you click on the “Create Account” button, the page will load and you will be redirected to your account page with the prompt saying “Thank you for your registration” along with your login credentials which can be seen in the sample screenshot above. You are given an option to download the Platform or trade using the web browser, for today, we will be trying out the web browser trader. Clicking on the “Web Trading” link located on the lower part of the demo account confirmation message under your Avatrade account will open up an additional tab with the trading interface. Use the login that was provided to you in order to try your Demo Account out. To start trading with the provided demo account, click on the very first tab located on the far left-hand side corner of the trading screen. Click on “Create a new chart” and choose CFD-Crypto from the drop-down selection box. These are the available crypto currency pairs that you are able to trade with. Once you have decided on which currency to trade with, click on it and the graph will reset to the chosen currencies you want to trade with. Today, we will be choosing BTC-USD as a sample pair. 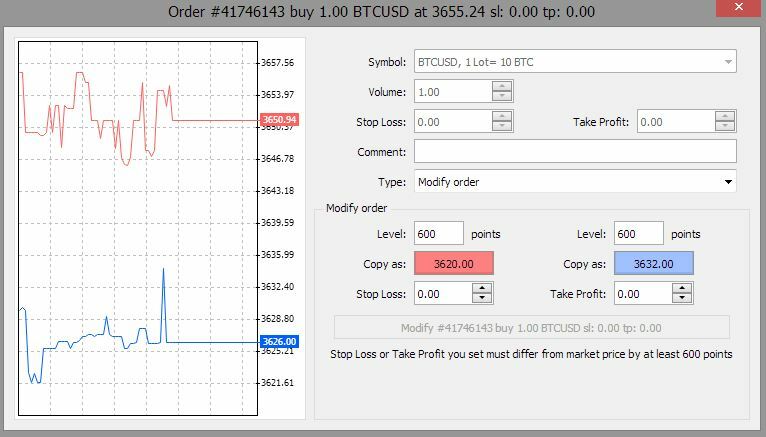 On the screenshot provided above, you can see down below that we have purchased 1 BTC for $3655.24. Right click on the order to access the “modify page”, which you are able to see on the screenshot below. Here at the edit window, you are able to cut your losses and cap your profit to make maximum profit out of every trade that you are making. Please be advised that it is better to have these numbers properly planned as when it comes to trading, always make sure that you cut your losses on an earlier time than having to ride it lower to the expected amount. If you are new at crypto currency trading as a whole, better read more about how to trade crypto currency with in-house FAQ’s for beginners through this link provided. To open up a Standard Account with Avatrade, there would be a minimum deposit requirement. For Credit Cards, the minimum deposit is USD 100, EUR 100, or AUD 100. Wire transfer’s minimum is $500 depending on the account’s registered currency. That can be in USD, AUD, and EUR. Here at Avatrade, you are able to choose from 8 different platforms to trade at. 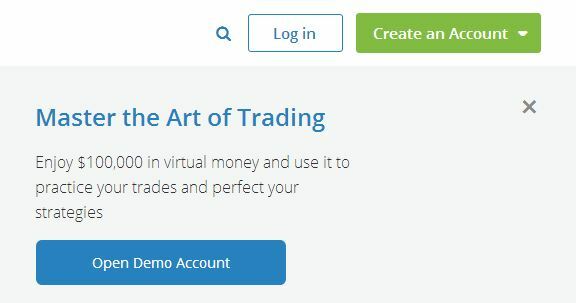 The Demo Account trading uses the Meta Trader 4 platform. The available platforms are AvaTradeAct, Meta Trader 4, MT4 Floating Spreads, AvaOptions, Automated Trading, Mac Trading, WebTrading, and Mobile Trading which you are able to read more about here. What is the maximum leverage for Avatrade? The maximum leverage for this website is 1:200. Please be advised that the leverage provided would depend on how much a client would need from them. This website accepts most of the common payment options for their clients to easily transfer funds from their personal accounts into their Avatrade ones. They accept Major Credit/Debit Cards and Wire Transfer. They also accept famous payment methods such as PayPal, Skrill, Neteller, and WebMoney. When talking about withdrawal, they use the same methods for depositing money. To request a withdrawal, you just need to go to the “My Ava” dashboard, follow the instructions on how to withdraw and select which option you want to go with. Please be advised that the request would be processed within five (5) business days. They also have the option for you to apply for an Ava Debit MasterCard, which of course, would decrease the withdrawal processing days. Both of these methods are free but please be advised that normal bank fees still apply when using bank options. How do they make money? They earn through their spreads and they take little commissions every time a trader makes trades. 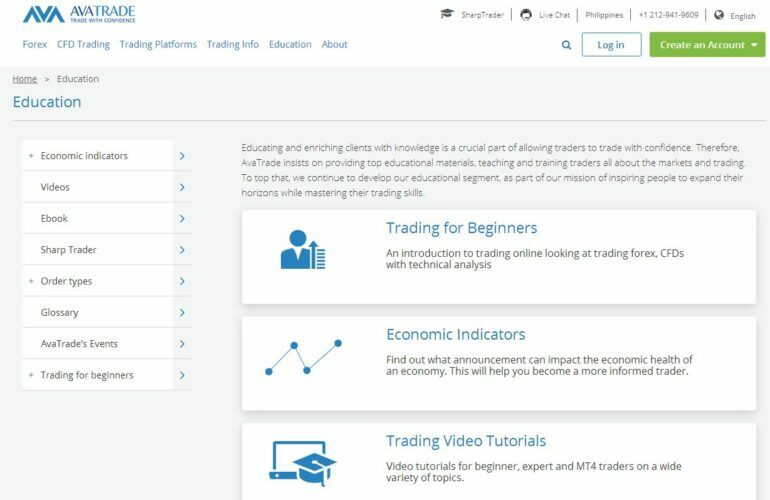 Just like any other broker website out there today, they try their best to provide all the information needed for a beginner trader to learn how to be better at what they do. Here at Avatrade, you are able to read their eBooks, watch their educational videos, and a lot more through their “Education” tab which can be easily accessed on their main page. Currently, Avatrade.com has a limited time offer of 100% bonus as they promise to match your first deposit of $300 and make it $600! You can read more about their current running promotions here. You always feel secure when you have a great customer service support ready to help you in any way possible when it comes to registering an account with any website today. Here at Avatrade, the team is available 24hrs a day, 5 days a week. This means that you are unable to contact them over the weekends, but are online 24hrs every day from Monday to Friday. You are able to contact them through email, live chat, and call them through their customer service phone line. Avatrade has more than a decade of experience catering to traders from around the world. That alone speaks for itself as they are doing a decent job in providing trading options for every type of trader. They not only have experience on their side, they also have the options for a trader to choose from, paired with educational tools and great trading advises, this website can go places! Though some people claim that they were scammed, these are just claims without actual proofs, just like any other scam claims out there today. If the website was new, that can be a red flag, but this has been operating for quite a time now and that should speak for the issue. They also have a good selection of customer service channels which you are able to use if you need any help with your account. With a good number of trading options to choose from, and with, of course, a demo account to play with! If you ask me, you surely can trade with confidence. But just like any other websites, do not take my word for it, try their website out today.